CARFAX 1-Owner, Very Nice. LX 570 trim. DVD Entertainment System, Heated Leather Seats, Moonroof, Third Row Seat, Navigation, Trailer Hitch, 4x4, LUXURY PACKAGE, HEAD UP DISPLAY, WHEELS: 21" X 8.5" 10-SPOKE ALUMINUM. CLICK NOW! Leather Seats, Third Row Seat, Navigation, Sunroof, 4x4, Power Liftgate, Rear Air, Back-Up Camera, Running Boards, Satellite Radio, iPod/MP3 Input, Onboard Communications System, Trailer Hitch, Keyless Start, Dual Zone A/C Rear Spoiler, MP3 Player, Keyless Entry, Privacy Glass, Remote Trunk Release. RADIO: MARK LEVINSON AUDIO SYSTEM 19-speakers reference surround sound audio, 7.1-channel architecture, 450-watt amplifier rated at less than 0.1% Total Harmonic Distortion, DVD REAR SEAT ENTERTAINMENT SYSTEM 2 11.6" screens and 2 wireless headphones, LUXURY PACKAGE Climate Comfort Seats, heated and air conditioned front seats and rear outboard seats, HEAD UP DISPLAY, WHEELS: 21" X 8.5" 10-SPOKE ALUMINUM center cap, Tires: 275/50R21 All Season, ACCESSORY PACKAGE (Z1) Cargo Net, Carpet Cargo Mat, Key Gloves, Alloy Wheel Locks (PPO), BLACK SHIMAMOKU WOOD/LEATHER HEATED STEERING WHEEL black shimamoku wood and leather door trim and black shimamoku instrument panel. Lexus LX 570 with Black Onyx exterior and Cabernet interior features a 8 Cylinder Engine with 383 HP at 5600 RPM*. Originally bought here, CARFAX Certified One Owner, Great color! Local Trade-in! 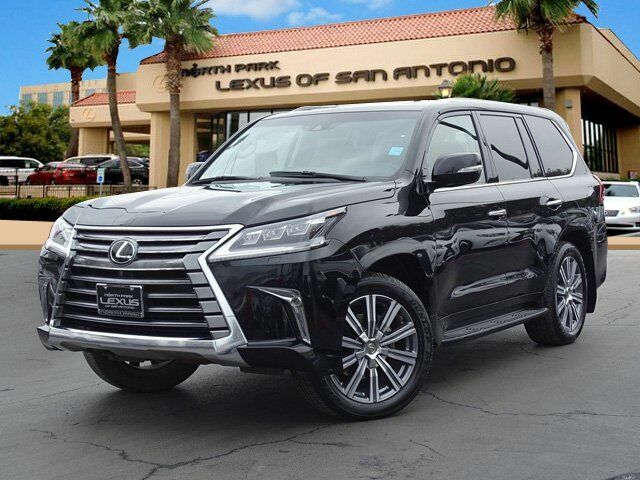 Blind Spot Monitor, Child Safety Locks, Electronic Stability Control, Brake Assist, 4-Wheel ABS, 4-Wheel Disc Brakes, Tire Pressure Monitoring System "Around town, the 2017 Lexus LX 570 is divine. It shrugs off potholes and bumpy roads with ease. It's like a luxury cruise ship riding over choppy waters without the slightest hint of a disturbance." -Edmunds.com.